The Fender Jazz Bass! | Gear Acquisition Syndrome!! – Watch where you park your car, or your rent will be gone to tickets. – Know what your “one thing” is as an artist, or you’ll never stand out among the hundred others… who also don’t know. – And finally, no matter how good you think you are, there’s always at least one person who’s better. But I also learned in L.A. about the Fender Jazz Bass, so… you know, it wasn’t all bad! I was turned on to the “Heavy Weather” album by Weather Report by a friend out there, and heard Jaco Pastorius play for the first time on one. Mm, mm, mmm… the things that that man did on that jazz bass! I always thought that the first melody coming in on that song was a synth or something. Nope. 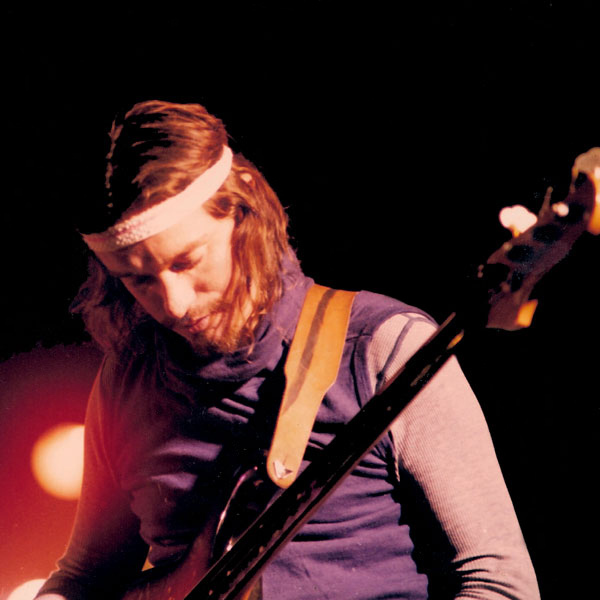 It was Jaco, playing and bending those thick bass strings while plucking artificial harmonics way up high on the neck. Our Little Boy’s All Grown Up! The story of the Fender Jazz Bass begins in 1960. That was the year that Fender decided to offer a bass that was complimentary in style and in tone to their “Jazzmaster” electric guitar. Up to that point, Fender had only released one bass model: the Precision Bass, or “P bass”, as it’s come to be called. The original intent of these changes was to lure Jazz musicians to the fold, though over the decades since then every genre of player has chosen the jazz bass for their voice. The tonal versatility made accessible by having two pickups instead of one caused this bass to be an instant sensation, and its popularity continues to this day. 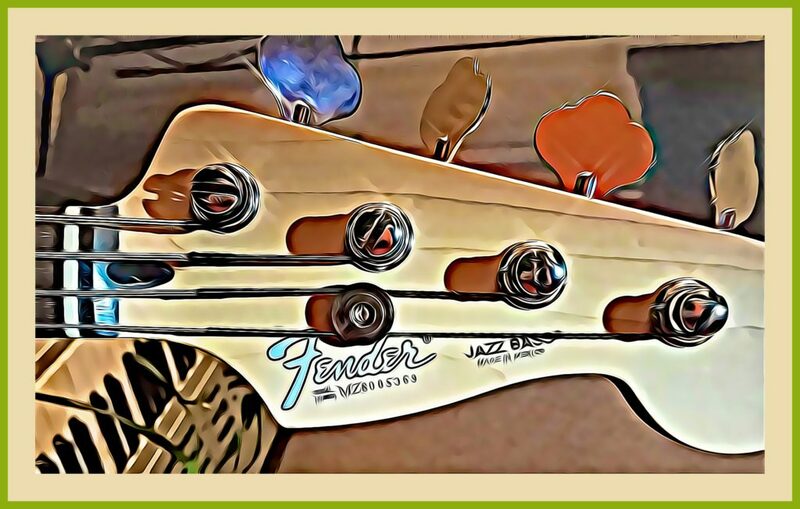 Many slightly modified iterations of the Jazz Bass have popped up over the years, but the essential Fender plan remains the same: keep the Jazz Bass brighter, and the P Bass boomier. And that’s the way their woods warm us to this day! One of the reasons the Jazz Bass never disappears is that so many notable, prolific players continue to sing it praise. 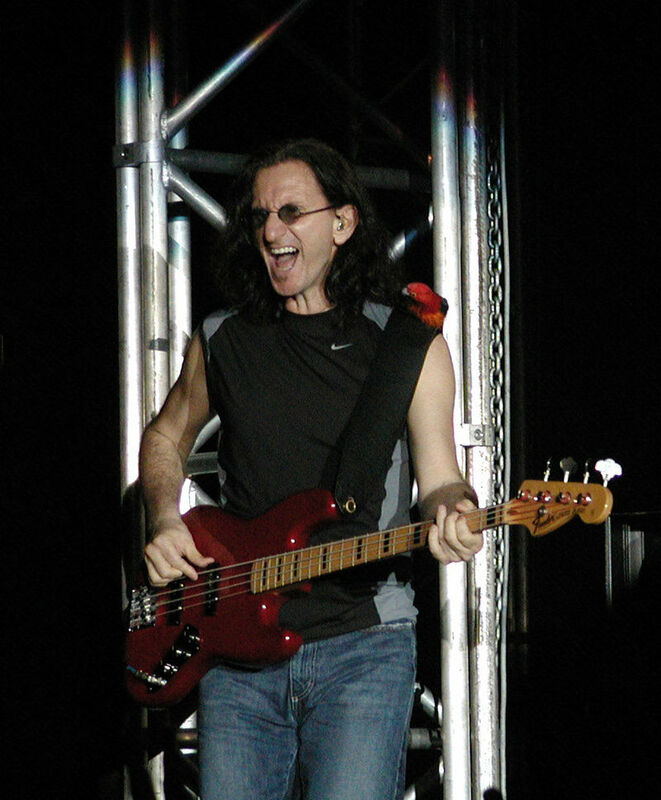 Geddy Lee, of “Rush” fame, on his signature Jazz Bass model. 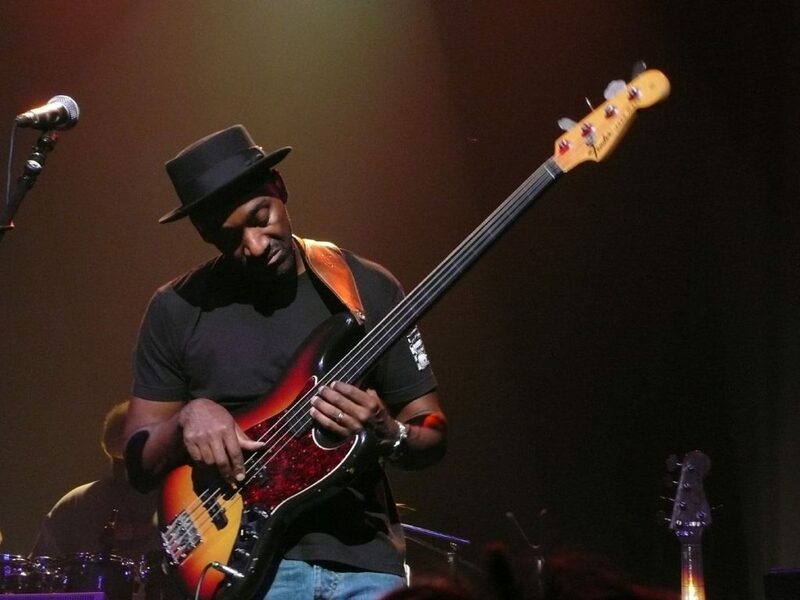 “There’s never been a bass that sounds like that bass (his black ’72 Jazz bass he calls “#1”)…. there’s a particular mojo to that instrument. (By the way, although Geddy had his jazz bass for years, he didn’t actually play it on any of Rush’s recordings until their biggest-selling album “Moving Pictures“. A Jazz Bass works in most situations. I made it work for me in every situation. I played that a lot on the “All That You Can’t Leave Behind” tour, and I really loved it. It had a great sound, the pickups were really, really punchy. 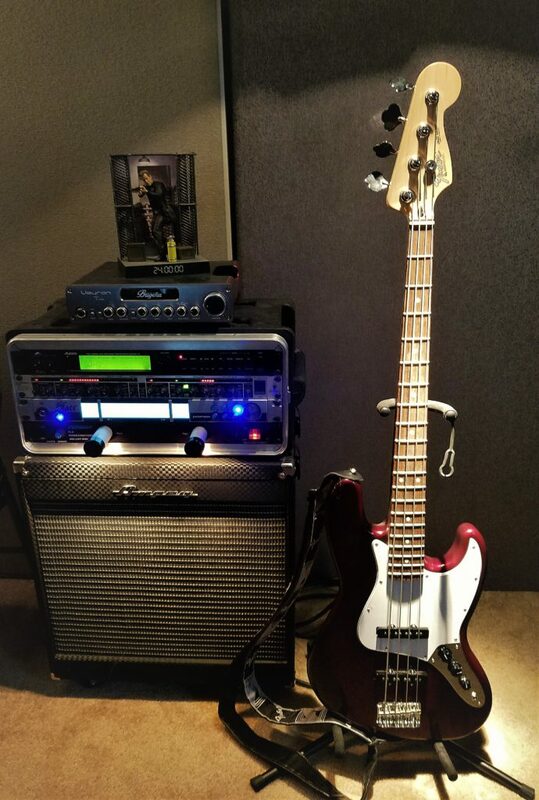 “The greatest bass I’ve ever played is the ’61 Fender Jazz Bass. It’s just a magic bass! It’s been a bass for so long, I guess it stopped being a tree a long time ago. Noel Redding; Larry Graham; Greg Lake; John Paul Jones; Sting; Marcus Miller… the list is long, folks. And it speaks for itself! If One is Good… ? Then two is better! Right?!! 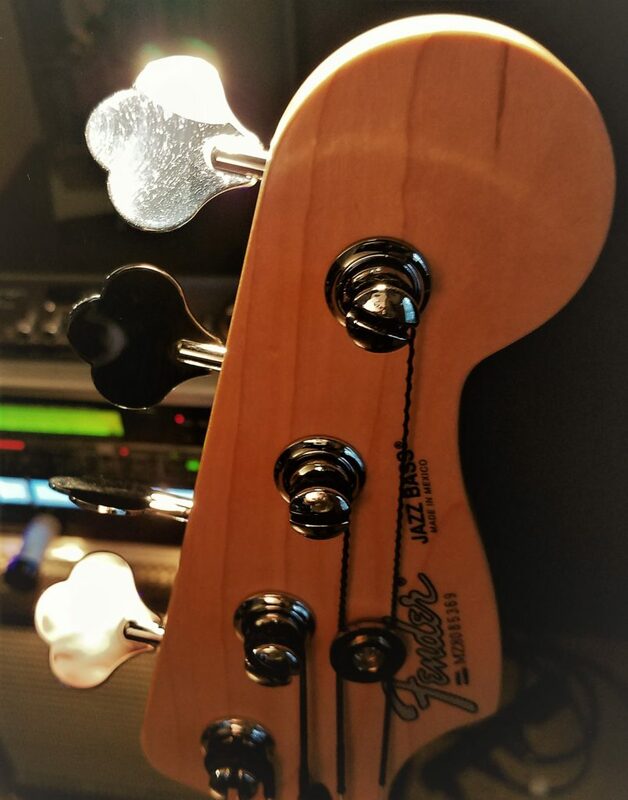 A big reason why many choose the Jazz bass is that, unlike the P-bass which sports only one pickup, the Jazz is engineered with two pickups, each with its own volume control. This by definition means you will have a larger variety of tonalities to choose from for any genre you want to play in. The neck pickup will yield a rounder sound, so this is what you can roll into if you want a more P-bass type tone. If you turn the volume up on only the bridge pickup, you’ll get a treble-y tone. It will emphasize the upper frequencies a lot. It won’t, however, be the most snarling choice available to you. That will come if you BLEND both pickups together at full volume. This is where the signature Fender Jazz “growl” starts snarling, darling! What you hear when you do this is specific frequencies being out of phase between the two pickups. Those frequencies cancel each other out, and that leaves a pronounced “scoop” in the midrange. 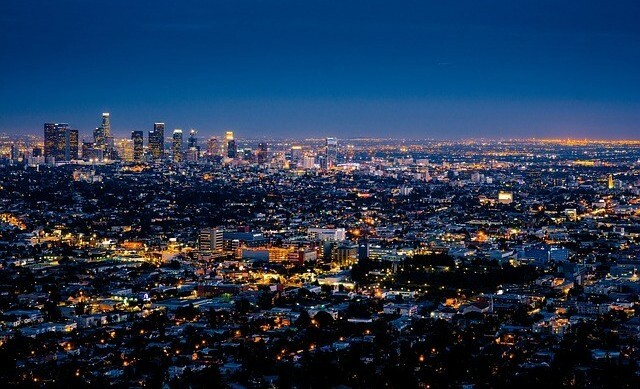 R&B, disco & funk players love this captivating cut… and with good reason! It pounces through the mix with a howl and a hunger, and is so eloquently percussive, it gives sharp teeth to any predatory groove you set loose on your booty-shakin’ crowd! single passive tone control. Not only does it afford you more tonal options, but it also usually comes with three bands of EQ to further facilitate tone-sculpting madness! 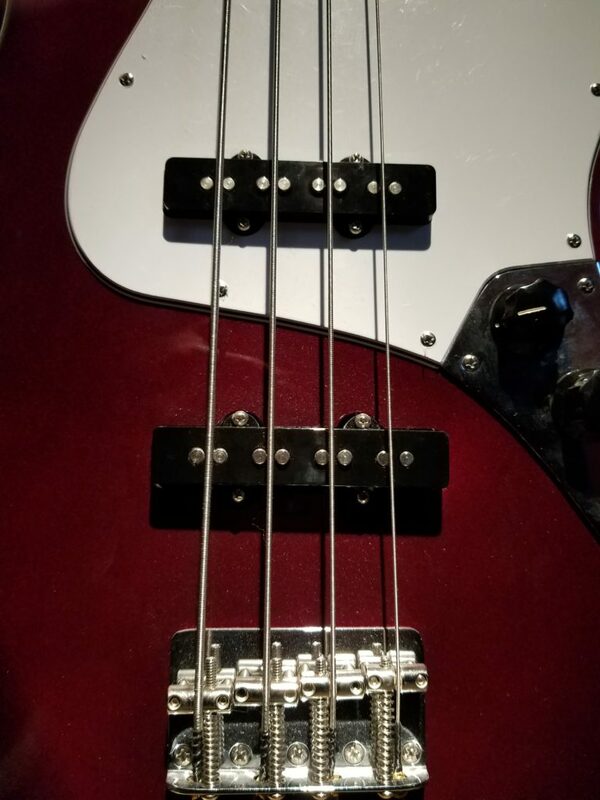 When the Jazz bass was first put into production in the 60s, it came standard with dual, stacked-knob volume & tone controls, one for each pickup. This configuration only lasted a couple years; in 1962 it was ousted as an option. Instead, they replaced them with a 3-knob arrangement, in which each pickup had its own volume knob, but only one Tone knob influenced the overall darkness or sheen of your sound. Still, either version allows a Jazz player a rich variety of blended nuances in their tone. The two are just different ways of achieving the same thing – a pleasing palette of boomin’ bass! You can still find some early Jazz basses out there if you try. Prepare to pay through the nose for them, but they’re out there! Some think that those early Jazz basses sound more similar to a P bass. I can’t say, ‘cuz I’ve only played modern ones. It IS clear tho’ that today’s Jazz basses do sound different from the originals. The best way of putting it is probably just to say that the high end is more pronounced, as is the mid-range “growl”. The first Jazz basses also featured felt, or foam, mutes under the strings to help tame overtones and keep the fundamental tones pure. These fell out of fashion after the 60s, but were all the rage then. As an example, I remember years ago seeing a Carol Kaye interview in which she talked about the importance of this mechanical trick being one secret to her sound. And what a sound it was – she played on THOUSANDS of songs!! There’s a ton of other little things that have come and gone on this fine axe. If you want an exhaustive list GO HERE. Suffice it to say that the basics have survived, but, like any instrument, over the decades Fender through little twists at us to keep us intrigued. But in the most important ways, “the song remains the same”, to quote a group which featured yet another Jazz player – John Paul Jones in Led Zeppelin!! Slap the Funk Outta You! I absolutely love the sound of the Jazz bass for funk. If pop & slap mean something more to you than a mixed martial arts term, then you know what I’m sayin’ – the Jazz tonal spectrum is perfect for servin’ up hot slices of stanky funk! I know Parliament said, “Make my funk the P-funk”, but, trust me, they were talking about the name of their band, NOT the name of Bootsy’s bass! How do we know this?? Because Bootsy started, with his tenure in James Brown‘s backing band, the JBs, with none other than… a Fender Jazz!! Obviously, the REAL funk comes from what’s on top of your shoulders and what’s at the end of your arms. You can only make those bodies boogie if you’ve wood-shedded enough to have your technique slippery smooth and contagiously strut-worthy. But if you’ve done your dance-band due diligence, the Jazz bass is your ace in the funkin’ hole, baby!! Take, for example, the following video uploaded by bass maestro Davey Pollitt. Yes, he’s obviously a Jazz bass AND a “Level 42” fan, but if you play bass… aren’t YOU??!! Now, whether the Jazz bass is TRULY the best-selling bass of all time… still remains a mystery. If you doubt me on this, just read through THIS ANIMATED DEBATE about it vs. the Fender P bass. One interesting insight concerning this comes from the behemoth of sales and provision we call Amazon. 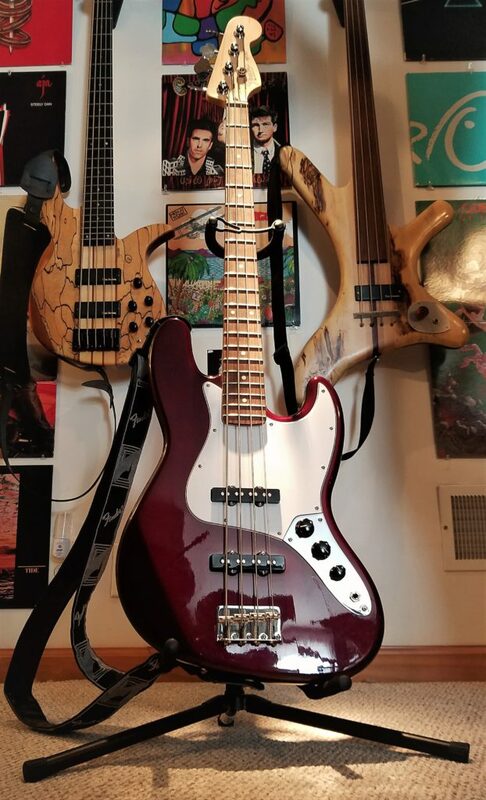 If you search under “best-selling bass” right now, as I just did, you’ll see that the first Fender bass that is near the top according to Amazon sales, is… the JAZZ bass! Pretty convincing testimonial that. Of course, their stats are updated every hour, so who knows if it’s always beating out the P-bass. As of today though… it is. Now let’s inch our way out onto a dangerous limb – Squier, Mexican or American??!! This question can really raise some hackles, but it need not. There’s a place for all instruments in our world, just as there are people with varying economic options that still really want to make music. The Squier series is the cheapest. In the middle is the MIM, or Made In Mexico, series. Finally, the most expensive standard model (without getting into Custom builds) is the American Standard. I watched a ton of vids to see if anyone out there had really done their homework and could really show AND PLAY the differences. The vid was a bit long, to be sure, but I thought the Andertons fellows did a thorough comparison which told me all I needed to know, and hear, to make a wise buying choice. But, you know, I think my 2nd choice might be the Squier now! It was brighter than the Mexican, which I like, and really held its own against the other two. The MIM was significantly darker, which might be good for some mixes, but I tend towards a tone with a smile of high frequencies in there somewhere, like my awesome axe from BASS MODS, which you can read the REVIEW OF HERE. We’ve probably all been there: you go to play a gig and, for some unforeseen and unfortunate reason, there’s a ton of NOISE in your signal. Fender thought of this eventuality in their design, and implemented an effective fix, though with certain parameters. They designed the pickups as “reverse wound, reverse polarity”, or RWRP. This simply means that when both pickups are at full volume, all hum is eliminated from your signal. In other words, they’re humbucking when they’re up and hot! If, however, you turn either volume knob down, it could (depending on your rig, the quality of electricity you’re getting, and if there are any dimming lights screaming through the circuitry nearby) introduce some noise into your signal. Each of these will either change your tone slightly, or limit the amount of tonal variety you’ll be able to eke out of the beast. My ultimate choice?? Use copper foil shielding inside the control cavities. From my research this will all but eliminate the nastiness that tries to claw through your single-coil heavenly tone. It’s something you can do yourself with minimal time and effort, even if you’re not a true “luthier”. THIS STEP-BY-STEP GUIDE will take you all the way there! 58 is… the New 20!! Hard to believe that the Jazz bass celebrates its 58th birthday this year. Wow! Time flies when we’re thumpin’ a groove!! I just did THIS SEARCH at Musician’s Friend, under “Fender Jazz Bass”. As you can see through that link, it brings up no less than FORTY-SIX different iterations of this cherished axe. Choices. Choices. So many choices!!! Modern, curvaceous, snarl-snarky and as revered and relevant as ever… you’ve GOT to try… the Fender Jazz Bass!! Special thanks to our boomin’ good friend Chris Oesterling for letting us examine his personal Jazz Bass for our article today. You rock, Chris!! It’s good to have heroes, ajibola40! It inspires us to play well and create for others so that they can have a hero… in YOU! To read about one of mine, READ THIS POST on one of the best guitar players EVER!!! 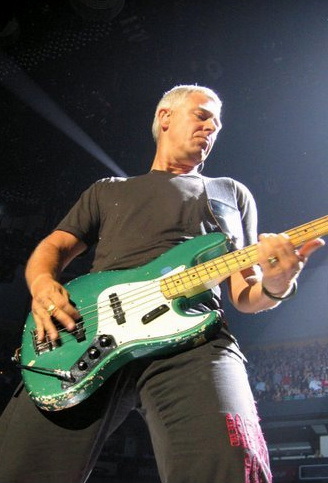 Yea, Adam Clayton has helped U2 maintain a loyal following by playing a solid bottom-end for their many hits. Gotta give him credit there. Which bass do you play?? Using any of my links takes you (or him) to the various music stores. They pay me a little but don’t charge you any more, so… we appreciate the patronage!! 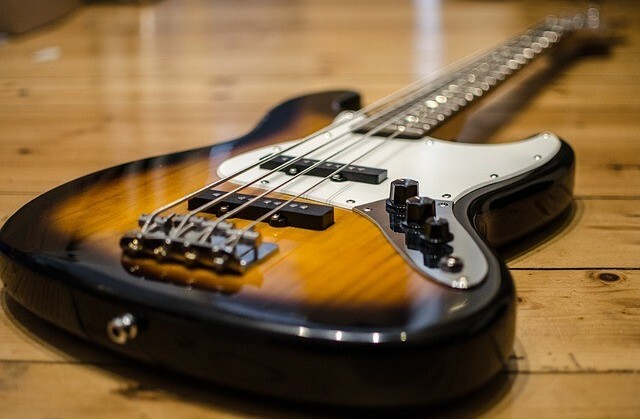 I love your post, there is so much information on basses that I never knew before, and anyone who plays a bass guitar at the moment and who is thinking of buying another would benefit so much from your post. My son plays the bass, and I know he is thinking of upgrading his guitar, so I will definitely be referring him this page. Very many thanks for your great info. Kenechi, I’m glad you’re putting time in to learn this fantastic instrument. Please go through THESE HOW TO PLAY BASS POSTS. I’m sure they’ll help you get a firm foundation on this instrument so you can keep progressing. Yea, those two pickups give us a lot of variety. Keep pumpin’ out those low tones to keep us groovin’!! Still making my little sounds with jazz bass though it’s not been easy for me to learn it properly because I have no one here to put me through. I like jazz bass and I can’t quit. I don’t find it funny listening to instrumentals or some music without jazz bass I love it but perfecting it has not been easy for me. I remember Geddy’s biggest selling album and I never knew why his album sold so well. Now I know more of the power of jazz bass and their is no need comparing it with any other instruments coz the jazz bass stands out and it’s unique on its own. I like the feature of jazz bass which is engineered with two pickups, and each of them having it’s own volume. 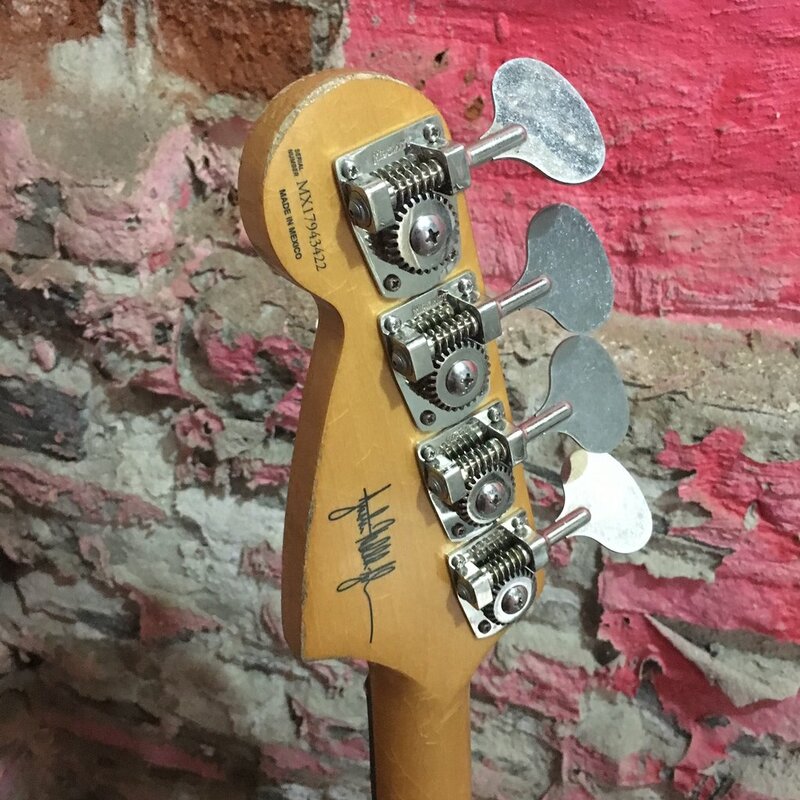 This a great and simple to follow guide on fender jazz bass. You laid it all out clearly and showed series of examples that helped emphasize your various points. This guide will be very useful for me. I am a good musician and my love for bass guitar started growing of recent.